Description: Is it possible to build supermanoeuverability (speedy change) into the DNA of a business? 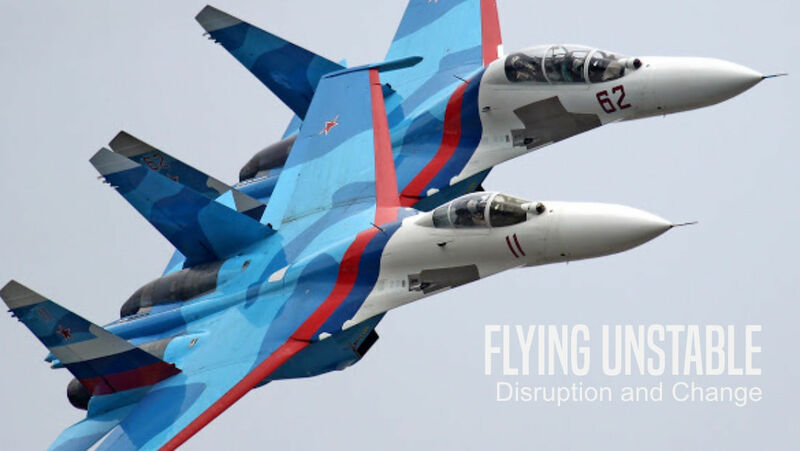 And what can we learn from today’s modern fighter planers with regards to Flying Unstable (the ability to be both agile and ensure the day to day business is done)? ‘Flying Unstable’, I was told, isn’t a good name for a presentation. Business won’t like a negative sounding title like that. Business, they said, preferred titles like ‘Built to Last’, ‘The 48 Laws of Power’ and ‘Strengths Finder’. But business needs to hear the message of ‘flying unstable’. Simply because if they’re going to survive and thrive going forward, if they’re not ‘flying unstable’ I think they’re doomed. Believe it or not, the more unstable a plane is, the more manoeuvrable it is. When it’s moving through the air, intentionally unstable, it’s already moving (turning) and this will make it faster to respond to control inputs, and this is highly sought after in fighter aircraft design. Thankfully, with improved technology, while the plane is intentionally unstable it doesn’t feel like that to the pilot, because the tech gives it a sense of stability. Why shouldn’t business want this as well? An intentionally unstable organisation ensures that when change is needed, it’s highly responsive to control inputs? I don’t know an MD or CEO I’ve ever spoken to who wishes her or his business moved slower when change was needed. One of the Holy Grails of any business is to have a collection of people who will move quickly and efficiently when change is required. And let’s face it, in today’s environment, change is regularly required. How to keep people (a business) perpetually ready for change, and at the same time focussed on the task at hand? It’s not an either/or, it’s a both/and.